In 1850 in San Francisco, there was a commodity almost as valuable as gold, and it was plentiful. Not that it brought in the same reward, ounce for ounce, but it made a few individuals very rich. That commodity was salt. It was in easy reach, wherever the briny water of the bay lay very shallow, lapping on the littoral edge and drying in the sun. A white crust of salt on the sand and dirt was the result. The gold rush brought thousands to this mecca of fortune, but they needed to be fed, and salt was in high demand. To get it to the boarding house kitchens, though, took some ingenuity and very tough men. The southern and eastern part of the bay is a large flat expanse, and creating drying ponds for the salt crystals to grow was a natural for this area. Acres of space was available, and the early inhabitants of the area, the Ohlone tribe, had harvested salt here for centuries. Former sea captain and failed gold miner John Johnson started commercial mining of salt in this area in 1854, selling it for $50 a ton, according to a Wikimapia article on the subject. Competition developed, bringing the price down to $2 a ton, but still it was a profitable venture. Eventually, the ownership of the salt production passed through the Leslie Salt Company, and finally to Cargill, Inc., the largest, privately-held corporation in the U.S.
Why bring this up on a blog purportedly about running? I had the opportunity to attend my nephew’s wedding two weeks ago, in Newark, California, located in the heart of the salt flats. The San Francisco Bay area is an amazing mix of have and have-not, beauty and ugly, ultra-high tech and grunt labor, old and new, the arts and sport, and academic and common knowledge. I flew in from Philadelphia to San Francisco and headed for the car rental area. This is reached from the terminal by a very modern, automated rail line. On arrival in the car rental pavilion, where all the rental companies have counters, I was amazed at the huge number of people waiting in line to get a car. Clearly, this would be a major week for tourism in the bay area. I was impressed how the lines moved, and the rental process was very streamlined. Thousands of people were renting cars while I was there. Once one’s contract is complete, a walkway leads to the garage where, on multiple levels, the cars are parked. I waited in another line until a young man escorted me to my car. We took the usual tour of the car to note scratches and dents, he gave me his card and told me to call him if I had any problems (a nice touch, Enterprise), and I was off. Instead of heading north into San Francisco, I headed south on Highway 101. This is a famous road, known in the early Spanish settler times as El Camino Real. Today, it passes through Silicon Valley, home to such major corporations as Oracle, Apple, Google and Adobe, to name but a few. Silicon is an element. It is the basis, due to its semiconductor properties, of transistors, diodes, and integrated circuits. From these came computers, and thus, eBay. The companies in this area have been enormously successful in recent years, and their employees are very well paid. The homes in this area are absurdly expensive. 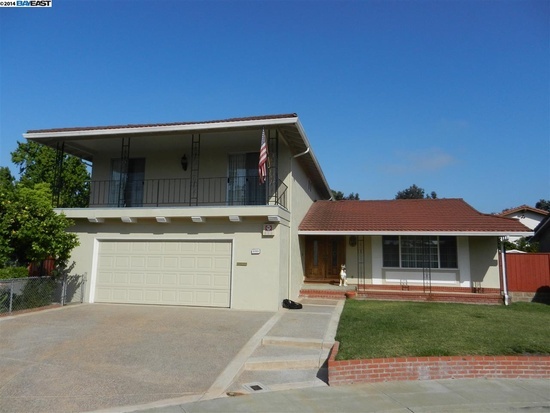 For example, a two bedroom, two bath ranch style house in Mountain View, 1953 sq. ft., with very little style on a quarter acre lot, is listed at $1,875,000. Heading down route 101, I made a turn onto route 84, which becomes the Dumbarton Bridge over the southern end of the San Francisco Bay. Along this road I could see the salt drying along the roadside as the east bay area is reached. This took me into Newark, home of Cargill’s salt headquarters and the site of the wedding. I checked in to the Courtyard Marriot Silicon Valley. They refer to it as Silicon Valley, but it is really on the wrong side of the bay. It is hard by the salt ponds. I arrived later in the afternoon and needed to get to the pre-wedding family dinner at my sister’s house in Livermore. This was a very pleasant dinner with lots of wine and good food. For the most part, everyone was in a good mood. The next day, Saturday, was wedding day. Since the wedding was not until 6:30 P.M., I had plenty of time to get a run in that morning. Newark does not seem to be a runner’s town. I asked at the hotel desk for advice where to run, and the desk person suggested a loop around the Lakeshore Park. I asked how long the loop was and was told it was about 2 miles. I went back to my room to check this out on the map. It turned out the loop was a bit under a mile, and was about a mile from the hotel, so I needed a little bit longer run. I put on my running clothes and headed out, trusty Garmin on my wrist. My route took me past the park and over a freeway to the wedding venue, a very pretty park called Ardenwood Historic Farm. It was where George Patterson, another unsuccessful gold seeker in 1849, was able to buy property in 1856 after working as a farm hand. He had a house built on the property, and started his own farm. Apparently, it was a very productive farm, as he was able by 1889 to rebuild the original humble farm house into an elegant Queen Anne style mansion. Today, the farm continues as a working museum, owned by the city of Freemont, and host to many weddings, day trips and farm experiences for students. Unfortunately, on my run, the whole park was locked up tight, and I couldn’t progress through it’s dirt roads. Turning back, I made my way to the Lakeshore Park, a man-made doughnut shaped pond with a paved path around it. I ran two laps around the pond, and marveled at the variety of birds that were attracted by this small body of water. Many different breeds of ducks, geese, herons, snowy egrets and numerous other species had made a home here, and it made for an entertaining couple of laps. On my way back to the hotel, along Cedar Boulevard, I made note of the homes along the road. Again, they were small, ranch-style houses with car ports. A number had for-sale signs. The last leg of my run was through a very long strip mall of shops, which seemed to be not the original intent for the stores. There were karate studios, hair salons, and a Chinese diner, to name a few, with empty shops between. After I got back in my hotel room, I was again curious about the houses for sale in this area. Looking up some prices, here the prices are much more reasonable. Offered for $899,000 was a five bedroom, three bath house with 2500 square feet. Still no bargain, but more living space than in the highly desired parts of Silicon Valley. Of course, I was there for the wedding, and it went off without a hitch. Well, not exactly, as my nephew and his new bride really did get hitched. The wedding venue was just beautiful, the outdoor ceremony was quite nice, and the after-wedding party was very enjoyable. 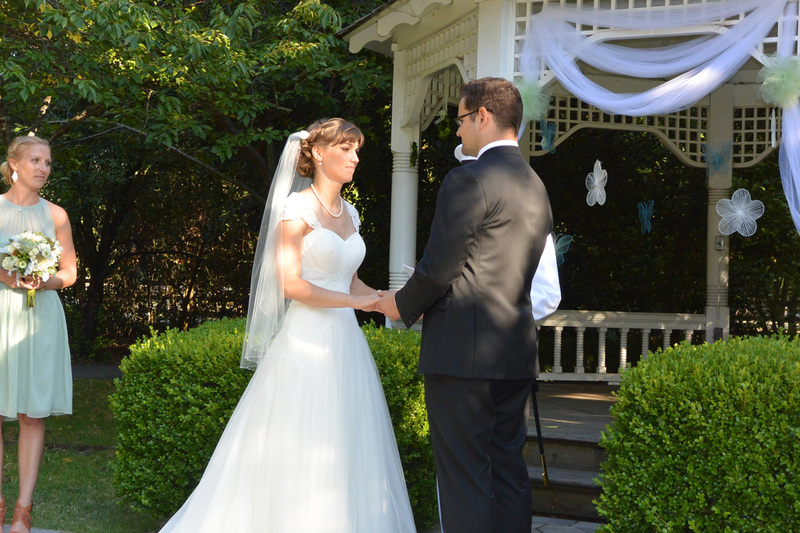 My nephew and niece-in-law say their vows. 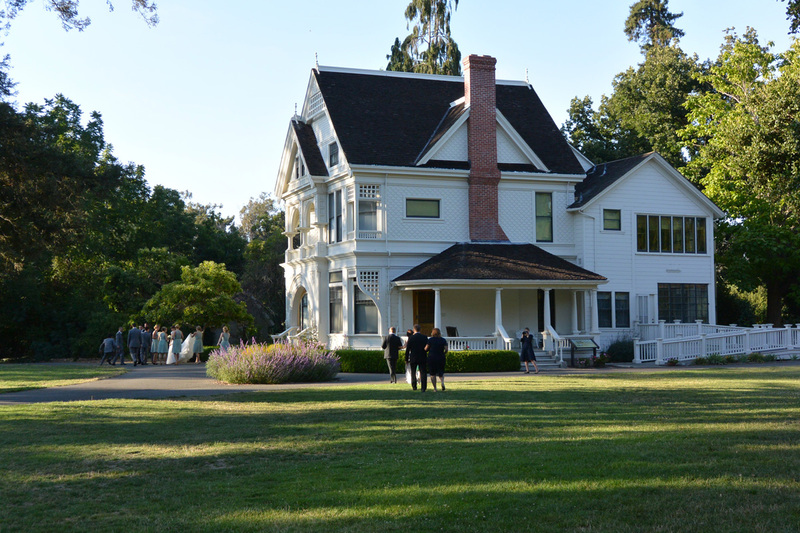 George Patterson house at Ardenwood Farms. On my way back to the airport the next morning, I again passed the salt encrusted shoreline, then passed a very large building being built along Route 101 with a Facebook sign in front. I stopped for gas and turned around in front of Oracle headquarters, a collection of rounded steel and glass tall buildings aside another man-made lake. I see it is thanks to these pioneers of computing and the internet that I am able to express myself on a WordPress blog. We’ve certainly come a long way from George Patterson building a farm.